What are Slides Apps? Deck.Toys provide apps which you may insert into your regular 'Google Slides' material. With the usage of the app, you can increase the questionnaire for a slide, within a slide and with a different mode of questions. 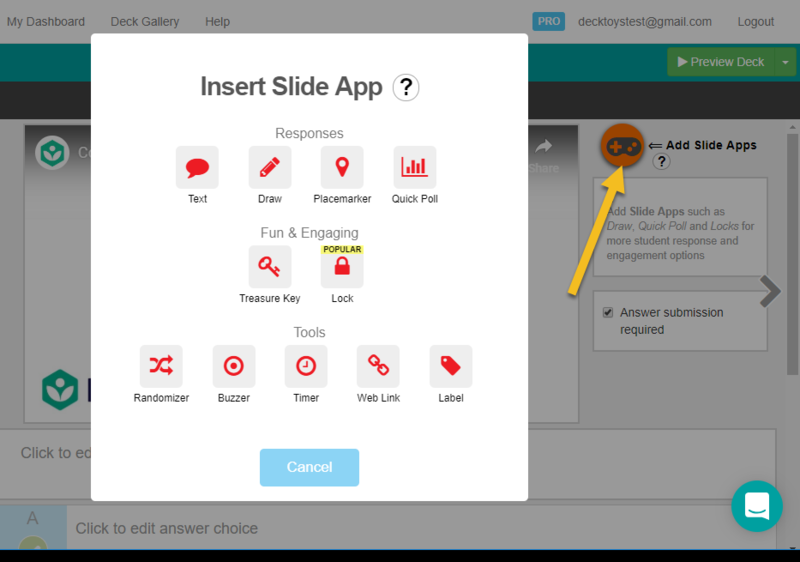 There are two categories of the Slides Apps, namely Responses and Tools. Under the Responses category, there are four components which you can use for the slide. Text response app is used for the student to elaborate on the answer. You may pre-select for the student to answer in 280 characters. The default length for a text tool is 140 characters. Draw response app is used for the student to sketch out the answer. You may also use this to request the student to draw on the image that you have embedded in the slide. Placemarker response app works when the question requires the student to identify the answer on an embedded image by placing a placemarker on it. An example of such a question is, "Please tell me where do you live? Identify your location by positioning the placemarker on the map." Quick Poll response app helps to capture the student's response to a specific question quickly. An example of such a question is, "Do you agree with the given statement?" A poll is rated by providing the number of stars, thumbs up/ down, tick/ cross, etc. Under the Tools category, there are six components which you can use for the slide. Note: To use Randomizer, Buzzer and Timer tools, you will have to launch it in the classroom during the lesson manually. Randomizer is used in helping you to select a random student to respond in the classroom. Buzzer helps to capture the student's attention during the lesson by requiring them to respond unexpectedly for point scoring. Timer works just as a physical stopwatch. Use this to keep track of the timing for a particular challenge which you need the student to complete. Web Link is used when you would like to embed external links to the slide. Once the student has completed viewing the links, the student is to mark it as complete to show the material in the external source has been read. Label is useful for you to add points of interest on a Slide Image. For example, labeling the different body parts of the human body. Lock comes in text, voice, number and direction format. Turns your slides into a breakout challenge for more thrill and excitement in solving questions.